If you are an investor, you should definitely use the weekly stock charts to help you find a good investing opportunity. Weekly charts often show us many interesting things that you won't be able to see in the daily charts. Weekly charts are suitable for long term investors who have a lot of money to invest. Because investors have a lot of money, they cannot enter or exit a stock within a few days. They need to slowly accumulate shares and sell shares over a period of time so that it does not affect the share price. Therefore, the weekly charts are the best for this kind of timing. Sometimes the sector's weekly charts can be very effective in showing us the time to enter a stock in the sector. By looking at the sector's weekly chart, we can often spot bullish patterns or bottoming patterns. When a sector bottoms, the individual stock in the sector may also get a lift and be propeled higher. 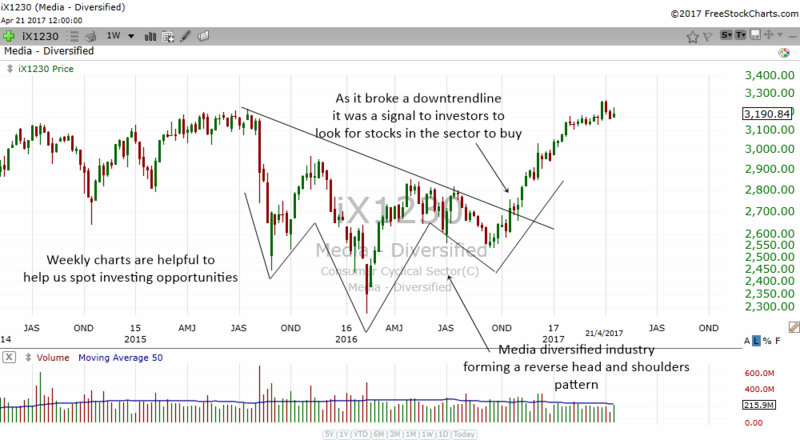 The chart above shows how the Media Diversified sector formed a reverse head and shoulders bottom in its weekly chart. 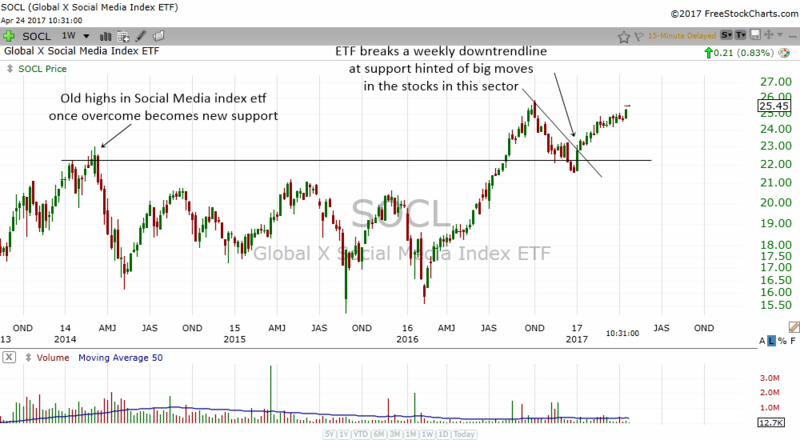 As the sector breaks above a weekly downtrendline, it told us that it is time to look for individual stocks to invest in. FOXA is one of the stocks in the sector. Notice how the stock formed a triple bottom in the weekly stock chart. The reverse head and shoulders in the sector chart pointed to us that a bottom in the sector is happening. This gave us confidence to invest in the stock. FOXA actually broke the downtrendline a little bit early before its sector broke its weekly downtrendline. 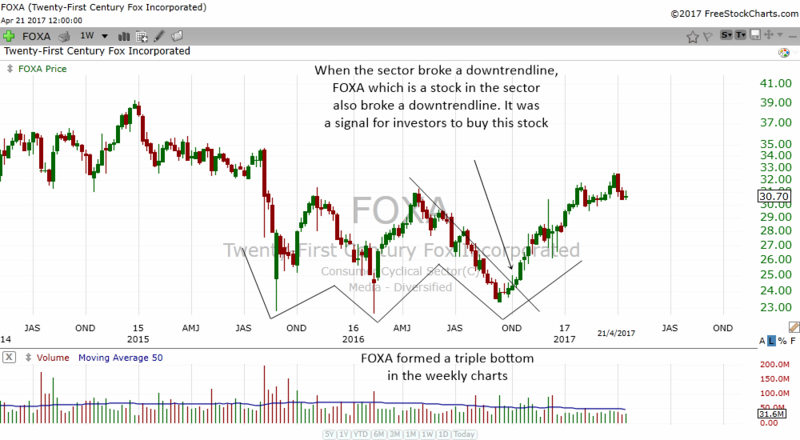 This gave us confidence that FOXA has bottomed and about to start a new uptrend in the weekly charts. If you think that trading the daily charts are the only way to trade stocks, then you are wrong. Bullish candlestick patterns does not only appear in the daily charts. In fact they even appear in the weekly charts. They are actually more reliable because they are more long term compared to the daily charts which can be easily influenced by the direction of the the general indexes. In the chart above, I have highlighted for you to see the many bottoming tails in the weekly chart of SEE. Bottoming tails work so well in all time frames that some traders actually buy the stock for a trade. The bottoming tail in weekly chart also allow large traders to enter the stock. Large traders may sometimes not be able to enter a bottoming tail trade in the daily charts because of the immense volume that they need to make a trade profitable and beneficial to their portfolio. A weekly bottoming tail on the other hand allows the large trader to slowly enter, buying shares each day throughout the week following the bottoming tail. One of the secrets of entering a stock very early is to enter the stock as it breaks above a weekly downtrendline. If you study the charts of many many stocks, you will realize that many of them tend to shoot higher once they break the long term weekly downtrendline. This allows a good trader to enter right near the bottom and ride the wave higher. 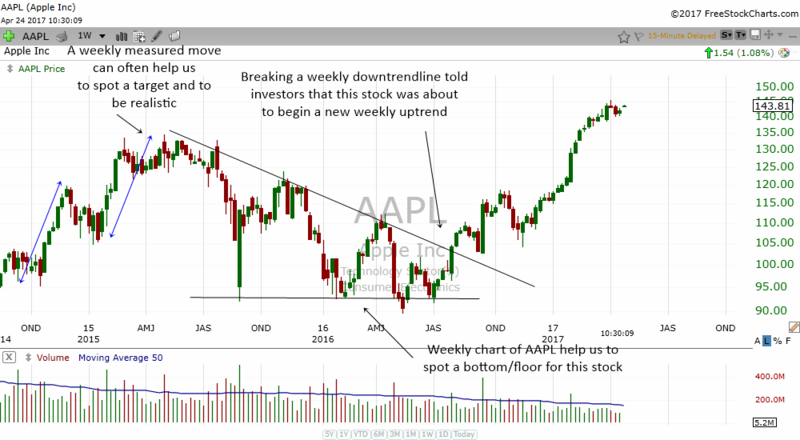 The chart of Apple above shows how profitable it is to buy the stock as it breaks a weekly downtrendline. If you look carefully, you can also spot a weekly triple bottom. This helps us to spot a bottom in the stock so that we can invest with confidence. 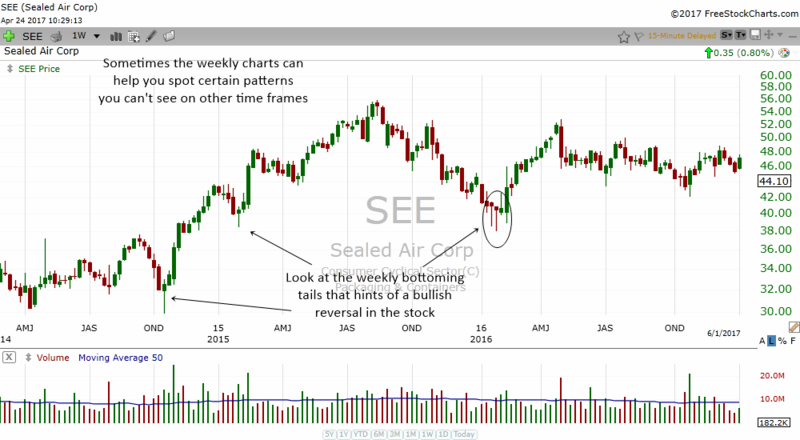 Another great thing that weekly charts can help us to do is to set realistic targets for our stock. You can see towards the left of the Apple chart how the measured move target showed us the exact top for Apple before it crashed lower. If you had not look at the weekly chart, you would never have seen the measured move which help us to be realistic of a stock's move. You can often spot big moves in a sector or industry when you look at the weekly charts of the sector/industry's etf or index. A sector that is at important support or resistance areas will affect the stock in its sector. When the sector rises or fall, it will affect the stocks in the sector by making them rise or fall at the same time. Let's take a look at the Social Media ETF. This ETF is home to stocks like Facebook. The weekly chart of the ETF was correcting to support at the old highs. Old highs once overcome will act as strong support. Notice how the stock bounce off support and when it broke above a downtrendline the ETF shot higher. What about stocks like Facebook? Facebook was at weekly support as well. In the daily charts, Facebook was forming a triple bottom. 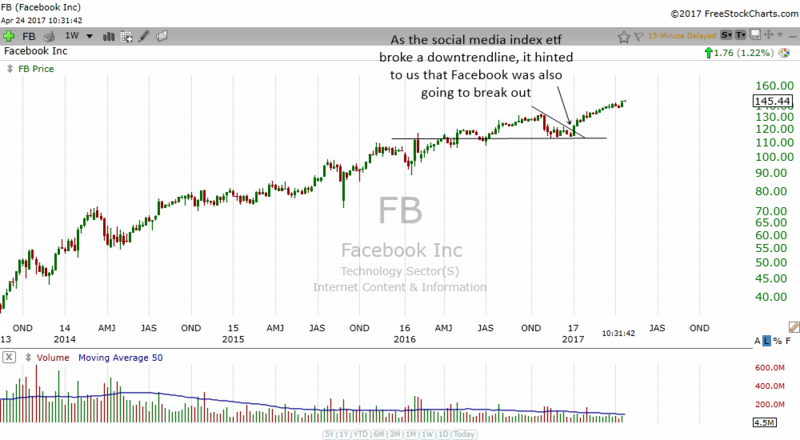 Facebook also broke its downtrendline the same time as the Social Media ETF broke its downtrendline. Facebook had confirmation from its industry's ETF and this give the trader confidence that this stock is going to move higher. 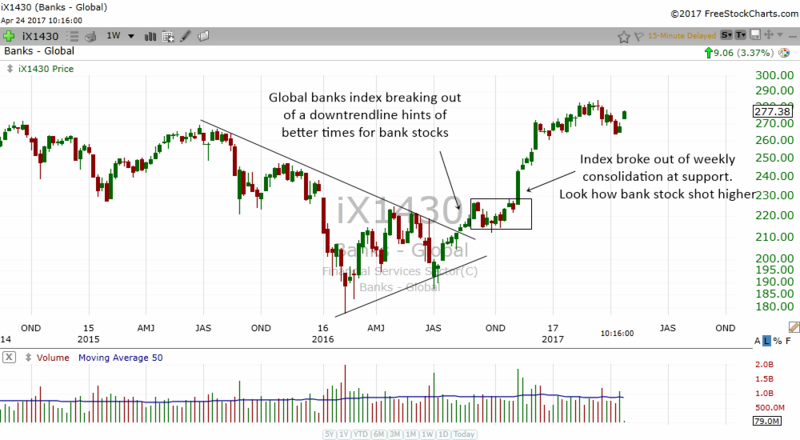 The chart above shows the Global Banks index. The index broke above a weekly downtrendline and then shot higher. The stocks in the index also benefited and found confirmation from this index. Take a look at the weekly stock chart of Morgan Stanley. 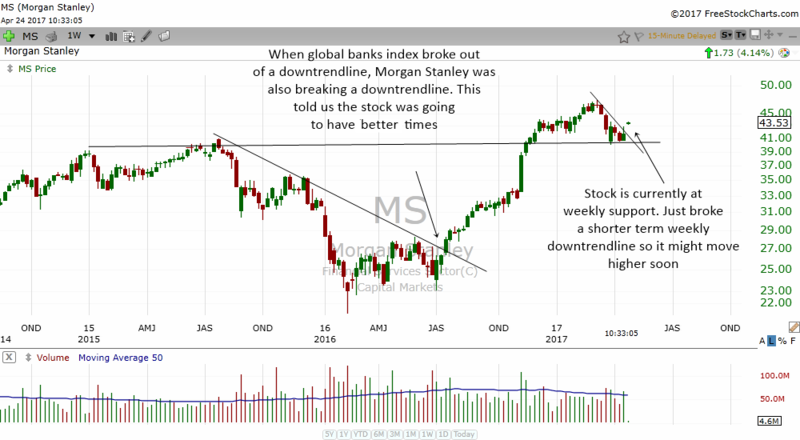 The stock also broke its downtrendline as the Global Banks index broke its weekly downtrendline. This gave traders confidence of their decision to buy Morgan Stanley. Look how high Morgan Stanley went up after that.